Browning: VW has momentum in U.S.
Browning: "It's all coming together." LOS ANGELES -- Volkswagen Group of America will show a profit on its sales operations this year for the first time since 2003, says CEO Jonathan Browning. And he says the U.S. business, which includes Audi, will be profitable next year, too -- even when a share of fixed global manufacturing costs are allocated that reflect the assembly plant now up and running in Chattanooga, Tennessee. "This is not just a volume game. This is about the quality of the revenue and quality of sales," Browning said in an interview at the Los Angeles auto show. "What you are seeing is customers connecting with VW and our momentum continuing." Sales of the Jetta are up 52 percent this year. Through October, VW brand sales are up 24 percent over last year and will top 300,000 for the first time since 2003. Executives say the automaker is on target to reach 800,000 sales in 2018. While that much-discussed 2018 objective represents a huge jump from today's volume, Tim Mahoney, VW's new chief marketing officer, sees how it can be done. Mahoney predicted the redesigned Jetta routinely will top 150,000 annual sales in the coming years, with the Passat close behind and the Tiguan in the 120,000-plus unit range. Through October, VW has sold 150,046 Jettas, up 52 percent from last year and on course to be an all-time high for the Jetta in the United States. VW had sold fewer than 22,000 Tiguans through October and about 10,000 Passats, which VW has just begun producing in Chattanooga. "Pretty quickly, we're up to 400,000 to 600,000 units," says Mahoney. "Then you add the Beetle, which is an emotional product, and cars like the CC, Golf R, GTI and Touareg to round out the image in styling and performance. And there are other segments we're evaluating. This is not an insurmountable goal. We're going to grow, grow profitably, and sustainably." John Mendel, American Honda's executive vice president of sales, said he worries as much about Volkswagen as he does about high-flying Hyundai and Kia. 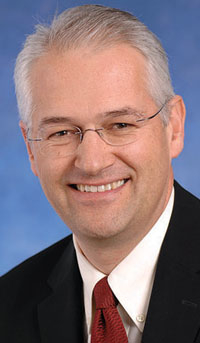 "VW does things globally very well," said Mendel, who was an MBA classmate of Browning at Duke University. "They've been inconsistently represented in the U.S., but now they have a real presence and plan. To take nothing away from rise of Hyundai and Kia, there is a real chance we're going to be talking about the rise of VW very soon. They are going to be a contender." 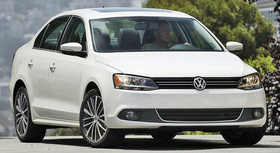 To grow, VW will have to conquest significantly more buyers. Browning said owners of Japanese and Korean brands have been typical conquests, but he noted that the redesigned Jetta has captured a large percentage of Chevrolet and Ford trade-ins, too. VW could expand its U.S. manufacturing footprint. Currently, about half of its units sold in the United States are assembled in North America, not counting the Passat production that has begun in Chattanooga. Browning wants that figure to grow to 70 percent, which might mean building a second line at its $1 billion plant. He wants those domestically built cars to have 80 percent local parts content. "Our product is attractive, our consideration is high, our dealer network is driving customer service and quality," Browning said. "It is all coming together to enable sales results. People love to talk about big numeric targets, but our focus is on putting foundations in place."